Summary : A tea that seems to perfectly blend lemon and spice at first sip quickly degenerates into nothing more than a black peppered flavored tea. If you enjoy drinking black pepper, then this tea has your name on it. Otherwise, pass it by and get a different lemon tea instead. Review : Few things in life wake me up more than lemon. And right now, early in the morning, I was in desperate need for something to get me up and moving. So I searched through my tea collection and came across an interesting Lemon Ginger tea from Yogi Teas. After reading through the ingredients, I became intrigued. Besides containing lemon, the tea had black pepper and peppermint in it, too. The combination of pepper, lemon and peppermint was an interesting mix, to be sure. Yet it also seemed exactly what I needed at this all-too-early of an hour. So I opened the box and eagerly brewed the tea. 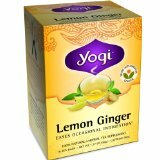 Yogi Tea's Lemon Ginger herbal tea contains the following ingredients : Organic ginger root, organic lemon grass, organic licorice root, organic peppermint leaf, and organic black pepper. The fragrance of the tea right out of the foil wrapper is quite strong. In particular, the lemon aroma was very distinct. Perhaps the best word to describe the teas fragrance is "peppery lemon." The taste of the tea, however, proved a big disappointment. I'll confess. I initially enjoyed the flavor of this tea. When I took my first sip, I enjoyed the tea and really thought I'd be giving this tea a high rating. It seemed, at first sip, that the tea found the "sweet spot" between lemon and spicy, somehow blending a tea with a strong lemon flavor that also had a mild pepper flavor mingling in the background. Unfortunately, just as I experienced with Yogi Teas Ginger Tea, the more sips one takes on this tea, the spicier and "more peppery" the tea becomes. By the time I took my fourth sip, the spice level was increasing and the pepper flavor was drowning out most of the lemon flavor. And nowhere at all was a peppermint or licorice flavor to be found. And just like with the Ginger Tea, by the time I was halfway through my cup, all I could taste was the pepper - all other flavors of the tea were gone, overpowered by the very strong pepper flavor. In short, drinking this tea beyond the fourth or fifth sip is like drinking pepper. If that's what you like, you'll love this tea. But drinking black pepper isn't for me. Overall, the Lemon Ginger tea from Yogi Teas was a disappointment, just like the Ginger Tea was before it. I'll give credit to Yogi Teas for trying something new - and at first sip the tea really did taste quite good. However, the pepper in this tea again drowns out all the flavors of the tea after a few sips. And call me strange if you want to, but drinking black pepper isn't my idea of a great beverage. Recommendation : No. Similar to the Ginger Tea by Yogi, this tea is at heart a black pepper tea. If you enjoy drinking black pepper, you'll indeed love this tea. However, if you're searching for a Lemon Tea or even a Spicy Lemon Tea that still has a lemon flavor, well, keep searching - as you won't find it in this tea.